Maple Sausage and Waffle Casserole Recipe - waffles, sausage, cheese, eggs, milk and maple syrup. Can make the night before and refrigerate overnight - smelled amazing while it baked - tasted even better!! 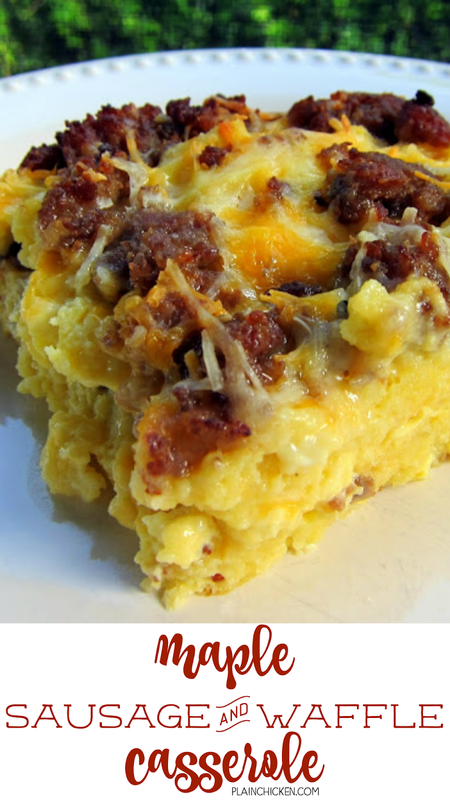 We've made a lot of breakfast casseroles and this might be our all-time favorite. Sausage, cheese, waffles and maple syrup - what's not to like?! I assembled this casserole the night before and let it sit in the fridge overnight. It smelled so good while it was baking and tasted even better! It was surprisingly light and the waffles were the perfect complement to the syrup. It was absolutely delicious! We ended up pouring a little bit of maple syrup over the casserole when we ate it. This would be the perfect breakfast treat for Mom this weekend. Cook the sausage in a nonstick skillet over medium heat, breaking it apart with a wooden spoon, until well browned, 8 to 10 minutes. Drain fat. Grease an 8-inch square baking dish. Add half of the cubed waffles in a single layer. Top with half of the sausage and 1/2 cup of the cheese. Layer the remaining waffles and sausage and 1/2 cup more cheese. Looks delicious and love the idea of waffles instead of bread. It would add a lovely fluffiness to this casserole. I cannot wait to try it out! A very cool idea. I'm seeing a lot more recipes using frozen waffles. oh my, there goes my diet! Yummy. we're out of waffles but have frozen pancakes, do you think that would work? or would it be/get too mushy? it looks DELICIOUS!!! ohmygosh this looks WONderful. A must try. Pinning so I remember. Seriously? I mean, seriously? This looks so amazingly good! I'm up to 95 minutes of cooking time, the eggs refuse to firm up. I'm resorting to covering with aluminum foil since the top is getting a tad burnt. Unknown - I just pulled this out of the oven and mine was done after 45 minutes. Not sure what is wrong with your casserole. It shouldn't take that long. Your recipe is wonderful must try this for my family. I've had this cooking for over an hour and it's really wet and mushy. I had to cover it with foil because the top was getting really brown. Are you sure the temp was supposed to be 325? mommy dearest - I've made this several times and never had that issue. I baked it at 325. Did you use Eggo Homestyle Waffles? Hi! I prepared this last night and baked it for lunch today. Mine took a good 65 minutes to get the eggs firm. I finally decided that the waffles were a little mushy. We ate it and the family all went back for seconds! However, I'm doubling this for a M.O.M. meeting this Tues. and need to get it right! Have you or has anyone else tried lightly toasting the Eggos first? I'm wondering if that will make them less mushy so I can figure out the baking time better. Thanks! Jamie - if your waffles were too soggy, I think toasting them prior to cutting them up would solve that issue. Did you use "real" maple syrup? Or just regular pancake syrup? I just want to make sure I get the flavor right and it's not too sweet. Amy - I used real maple syrup. I love breakfast dishes like this, thanks for sharing! To complete my previous thought ^^ I want to half it and bake it in a meatloaf style dish..
Jasmin - I've never halved the recipe, but I think it would work in the loaf pan. I do cut the waffles frozen, but you can thaw them. Some people toast the waffles before cutting them also. This would adapt well to a more diet friendly casserole with substitutions. I'm going to try it "slimmed down"-will let you know the results. Can you use regular syrup if out of maple? I haven't made it in the slow cooker, but it should work fine.